Probably the best way to understand the players, diversity and “brainpower” behind the Shakespeare authorship question is to attend one of several conferences that are held throughout the year. One of the best is coming up soon in Toronto. North America’s two leading Oxfordian associations –the Shakespeare Fellowship and the Shakespeare Oxford Society — have announced that their 2013 Joint Conference will take place in Toronto, Canada from October 17 – 20, 2013 at the Metropolitan Hotel. In addition to a variety of papers on related subjects, there will be a trip to Canada’s internationally-acclaimed Stratford Festival to see a production of “The Merchant of Venice” and meet the director Antoni Cimolino who is also the new artistic head of the festival. The conference events will also include an open public debate on the authorship question and a screening of at least one new film about the authorship. Check the two websites for registration information and special conference hotel rates. 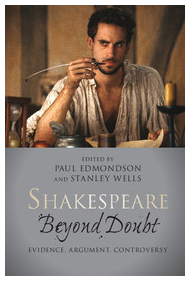 “Shakespeare Beyond Doubt:” and “Shakespeare Beyond Doubt?”; one a declaration of fact. The other an inquiry and counter-argument to the first. These two books, both published in late May, offer perhaps the best opportunity to date to examine in detail and from multiple points of view the current evidence and arguments regarding the authorship of the Shakespeare Canon. Were the works created by a singular genius born in Stratford on Avon, or were the names “Shakespeare”, “Shakspeare” and “Shakspere” pseudonyms, used to conceal the true author(s) of the most extraordinary literary works ever written? 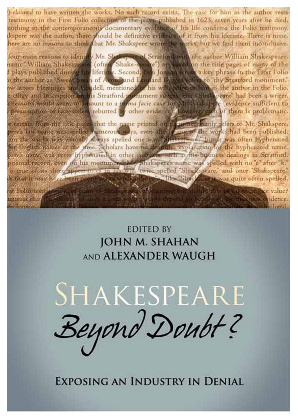 “Shakespeare Beyond Doubt: Evidence, Argument, Controversy” argues adamantly for the traditional story. It was edited by Paul Edmondson and Stanley Wells, and although the book was published by Cambridge Press, both of the editors are officially associated with the Shakespeare Birthplace Trust, the sole purpose of which is to preserve the official legacy. The fact that Mr. Wells, Mr Edmondson and the Birthplace Trust felt such a strong compulsion to compile this collection of essays in support of their orthodoxy is telling; and represents a shift in the “authorship zeitgeist.” As more and more people throughout the world have begun to question the traditional story, Wells and Edmondson recruited an esteemed group of scholars and writers to try and shore it up. The second book, “Shakespeare Beyond Doubt? – Exposing an Industry in Denial” is a fierce and thoroughly informed response to the arguments made in the Wells book. It takes them on point by point. The book was compiled by John Shahan and Alexander Waugh. Shahan has been an articulate spokesman for the anti-Stratfordian position for many years. 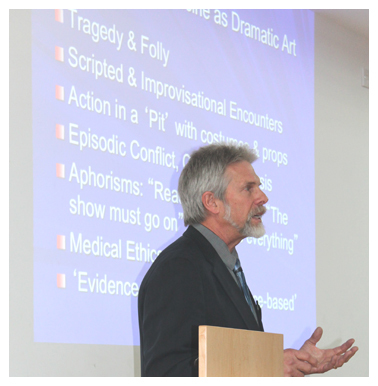 He founded the Shakespeare Authorship Coalition and launched the Declaration of Reasonable Doubt, which has succeeded in getting academics, artists and professional lay people throughout the world, including Mark Rylance, Sir Derek Jacobi and two Supreme Court justices to state categorically that there is definitely “reasonable doubt” about the identity of William Shakespeare. The two books offer an excellent opportunity to learn from the debate: Beyond Doubt? Or Reasonable Doubt? You decide. The position of the Roundtable is that authorship is a legitimate question worth asking. Most academic institutions not only refuse to make the inquiry, but demean those who do. Our goal is to encourage more research, provide a forum for new evidence and ideas and oppose unofficial censorship.